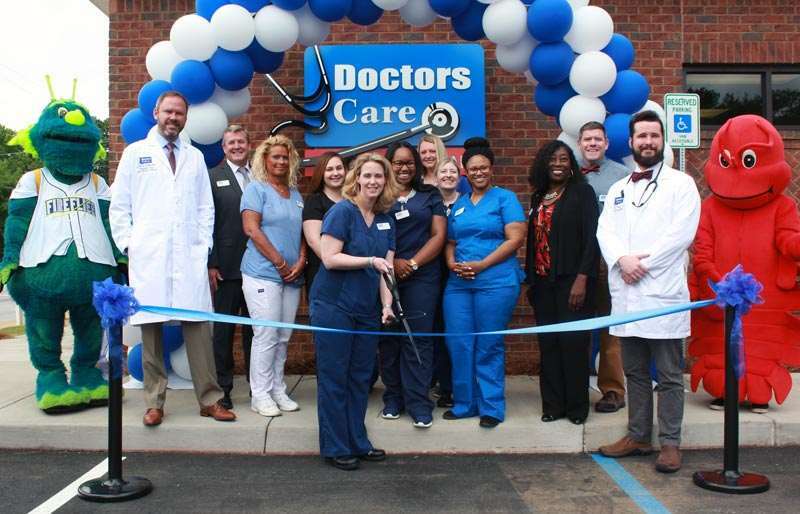 Columbia, S.C. – Doctors Care P.A., South Carolina’s largest urgent care company, held a ribbon-cutting today to celebrate the opening of its newest center in Columbia – the company’s 54th location in South Carolina. Doctors Care Shandon, on the corner of Harden Street and Rosewood Drive, is conveniently located near many of Columbia downtown neighborhoods, several grade schools and the University of South Carolina. This is the 13th Doctors Care location in the central Midlands, and the fifth new location that Doctors Care has opened in less than a year. Dr. Curtis Franke, acting president and chief medical officer of Doctors Care, said the new location was built to replace an outdated facility about a mile away, and strategically located to bring modern, affordable health care to the heart of Columbia’s downtown residential and university districts. As part of the ribbon-cutting ceremony, a check was presented to support the installation of public art and beautification projects along the retail corridor between the Shandon and Rosewood neighborhoods. One Columbia for Arts and History Executive Director Lee Snelgrove, and the Rosewood Merchants Association Executive Director Dave Britt, were on hand to accept the check. “One Columbia is pleased to be a partner on yet another major public art project that brings a community-minded business in collaboration with a merchant’s association and neighborhood residents,” Snelgrove said. According to Britt, the construction of Doctors Care Shandon also has inspired renewed interested in investment and property enhancements. Doctors Care Shandon is more than 4,300 square feet, with eight exam rooms plus trauma space, on-site laboratory and X-ray rooms, and spacious accommodations with modern finishes. The new facility’s address is 2601 Rosewood Drive. Hours of operation are Monday-Friday, 8 a.m. to 8 p.m., and Saturday-Sunday, 9 a.m. to 5 p.m.
Doctors Care, now celebrating its 36th year in business, is a leading health care organization focused on delivering exceptional and convenient urgent care, family care and occupational health services. Its original clinic, opened in Columbia in 1981, was the first urgent care center in South Carolina. Now, Doctors Care is one of the largest urgent care companies in the United States. Its network of 52 clinic locations continues to expand to serve patients who want quality health care that’s also convenient and reasonably priced. Doctors Care centers offer online check-in, flexible hours, on-site X-rays and laboratory services, telehealth access and more. Visit DoctorsCare.com to learn more.